Is there anything more fun than teaching the balcony scene? We get to expose students to some of the best writing that’s ever been produced in the English language as well as an easily accessible scene with understandable conflict and a little romance. In fact, I find the balcony scene such a great way to introduce students to Shakespeare that I usually start off the play reading it. Because it’s Shakespeare you want to have some fun with it. Here are some activities that you can do that will help students understand the situation and the language. The Royal Shakespeare Company has a lot of good resources for those who teach Shakespeare. Here’s a link to a resource that deals exclusively with the balcony scene. Within this packet there’s a link to a series of images from different productions. As the students look at them, ask them to notice what are common trends in these productions. 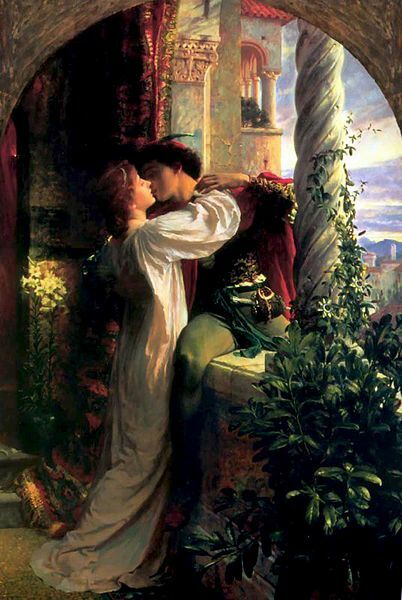 What’s apparent right away from them is that there should be a significant distance between Romeo and Juliet – in some cases, it appears that they can never actually touch. But the distance is always visible, or at least there is always the wall of the balcony between them. Students should observe that the physical distance represents the barrier that exists in their relationship, so this bit of staging is important. All of the actors are different ages too, and none of them are teenagers. Ask students if this works for them. Are they able to suspend their disbelief and pretend that they are young lovers? It’s a great opportunity to talk about how drama works, especially on the stage – we are willing to accept a lack of realism on the stage that we don’t in a film. If we see wires holding up a flying person on stage, we are okay with that. If it happens in a movie, we think the special effects are lousy. The balcony scene has been rendered in art a number of times. Just do a search for “romeo and juliet painting” or “romeo and juliet illustrations” and you’ll find some good examples (and some weird example of what I can only describe as fan art.) Pick a few of the better ones and ask students to analyze the choice of color, the composition, etc. This is a great way to meet CCSS.ELA-LITERACY.RL.9-10.7 which asks students to examine an interpretation of a scene over various media. As an extension of this activity one thing I’ve done in the past is pick about five painting or illustrations from the play and put them on slides. I project each one for 5-10 minutes and ask students to tell me what scene is depicted, how they know, and which line from the play they would use as a caption for the image. It’s also a good way to assess CCSS.ELA-LITERACY.RL.9-10.7. Once students have read the passage once, you can have them go back and look at some of the stuff that’s going on. One of the activities involves finding words in Romeo’s opening soliloquy that have to do with light. We then talk about why they chose certain words. They frequently miss the word “window,” for example, and we talked about why that might have been a good choice. They also picked “heaven” and we had a good discussion about why we associate life with heaven (near death experiences came up since people talk about “seeing the light.”) And then finally what “light” might have to do with the scene in general beside providing unity. Of course you’ve got a great opportunity to clear up the misconception that “wherefore” means “why” and not “wherefore.” They’ll see that in other Shakespeare plays as well. But we also have a great Shakespeare quote that students might know apart from the play: “that which we call a rose by any other name would smell as sweet.” Have students put this concept in their own words (they’ll inevitably fall short) and have a conversation about the importance of names. How much of your identity revolves around your name? Everyone will tell you Shakespeare shouldn’t just be read; it should be acted. And this is a great scene to have some fun with. And you can work with a small excerpt – just the first few lines will do. You can break students into groups and assign different emotions. For instance they can play Juliet as angry than Romeo has appeared in the garden, or super scared that they’ll be discovered. Another thing you can do is have a couple of students playing Romeo and Juliet while a couple of other students pose as guards and slowly walk in front of them from one side to the next. When the guard get within a certain distance (tape on the floor works well) Romeo and Juliet have to whisper their lines. This is pretty fun, but you do need to have a decent sized area in order to make this work. And as always, anytime you have students acting in front of the classroom its a good idea to give them a little time to practice beforehand. The Royal Shakespeare Company has a lot of good resources for getting kids up and moving when you do Shakespeare. As much as I like the Zefferelli version I’m a big believer that students need to see Shakespeare as it was meant to be seen: on the stage. Here’s a link to a rehearsal of the balcony scene done by the Royal Shakespeare Company. The Globe Theater has a terrific series of filmed productions that are well acted. Here’s a preview of one of them. You can purchase the DVD on Amazon. Frequently my students like these better than the films. And here’s a teaching tip – if you watch the film, turn the subtitles on. That way students are getting an extra dose of Shakespeare!